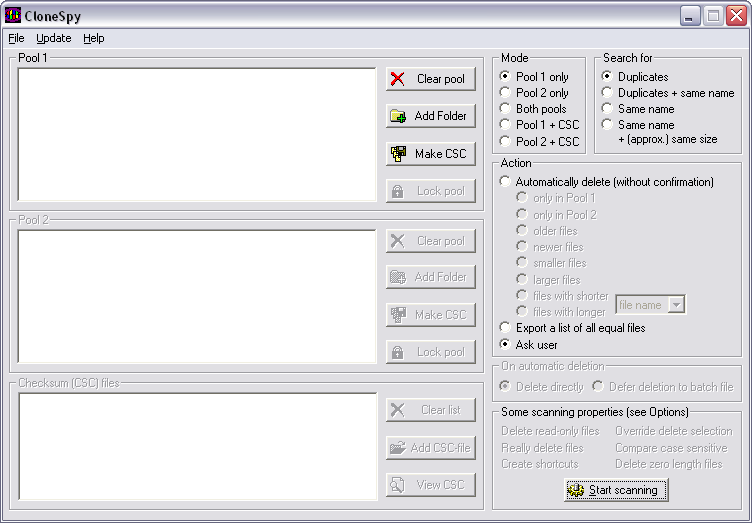 CloneSpy can help you free up hard drive space by detecting and removing duplicate files. Duplicate files can have exactly the same contents regardless of their name, date, time and location. It is able to find files that are not exactly identical, but have the same filename. Perhaps you have different versions of a file and you want to find all of them and remove the older versions. It can also find zero length files, which are files that have no content. Great tool, have used it for years. This program has no way to filter searches, which is a serious detriment if you have a lot of files. Good program, but the duplicate detection engine needs some serious work. To check my sample of 232GB for duplicate files CloneSpy took 17minutes and read 53GB of data from the Harddisk. Hard to argue with the results of CloneSpy. Works like a charm, and is faster than the rest. DoubleKiller is fine, but doesn't have nearly the accuracy and features that CloneSpy has. I would also suggest anyone looking for a duplicate files locator to try "DoubleKiller". My experience was just the opposite of jamomea's: CloneSpy found what a half dozen other duplicate finders could not and did not take forever doing so. I even tried to trick it by renaming some of the files and it still flagged them as duplicates. CloneSpy is fast, easy, and accurate, which makes it well worth a donation. Pros: Has a lot of config options and pretty fast. Cons: Does not really seem to find any duplicate files. I tested it against My Music folder which contains 4,971 files - CloneSpy found 0 duplicates (but did so pretty quickly!). I then tried Mo-Search's built in [Find Duplicate Files] tool (also freeware) and it took longer but found 420 files, but: all files where album art. Overall: Better free tools are out there. "With CloneSpy you can build checksum files from files on CDs (or even on hard drives, etc.) and use them to check whether these files already exist on your system. The checksum files will prevent you from having to play DJ every time you search for duplicates!" That certainly is a nice feature if you need it, and DFF does not have that, but DFF's interface makes more sense to me even if they are in fact pretty similar. What really made me switch from CloneSpy is the fact that CloneSpy simply did not find a very obvious duplicate file in a folder I gave it to search, and I have no idea why it didn't. With DFF I had no such problems. Also, DFF seems quite a bit faster with CSC checksum generation on my system than CloneSpy. I'm rather tired of seeing the elusive utility named "Duplicate File Finder" being vomited all over the site--as if anyone cared about it. CloneSpy is pretty impressive in its functionality and sound design. There are some relatively minor issues while running 120 DPI, but nothing insurmountable. NOTE: there is another product, same name, here at FileForum, but i's a DIFFERENT product & shareware. Stopped searching for similar tools when I found this one. Also like the possibility to search for files with same name and approximately the same size, since this allows to find documents with minor changes.